Having shelled out a good few bob for a DJI Osmo Pro X5 camera, lens and handle plus batteries I was less than impressed with the fan noise during filming. Especially when they have fixed this on the X3 camera. The noise during filming makes the camera unless in an open mic situation on a film set. 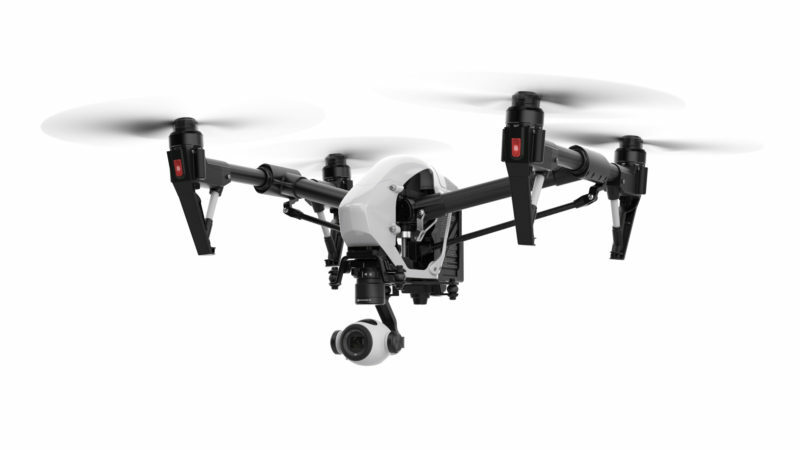 I do hope DJI are onto this and can come up with a solution ASAP. I do like the ability to focus a lot closer with the X5 and the shallow depth of field compared to the X3 (closest focus = 1.5m) but was hoping for more control over the cameras ISO, rather than the usual 100-200-400 etc. some steps in-between would be nice. Another urgent issue that needs addressing is the ability to switch off the front red LED tally light, this is not an issue with the X3 as it has no tally light. 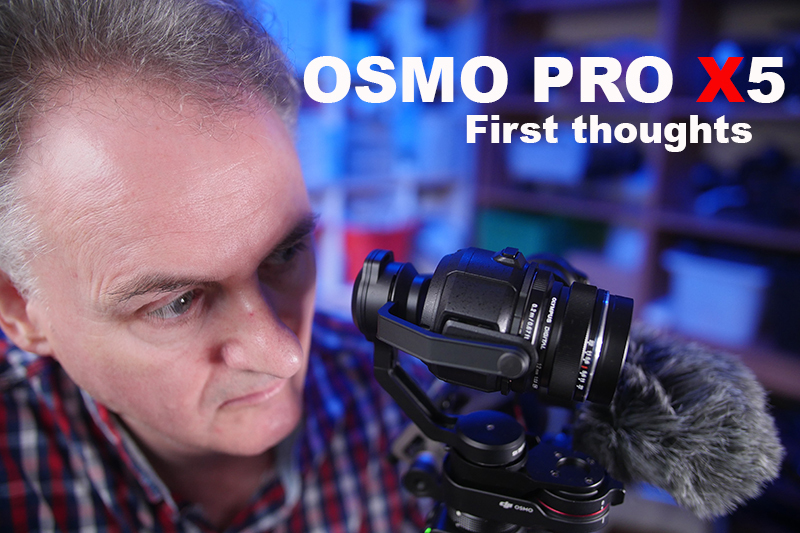 Where the OSMO Pro strikes in my opinion is in low light, that micro 4/3rd sensor gives you a fantastic advantage over the X3 in low light quality. I will experiment with a radio mic today. Reduces Canon Log 2 noise in dark areas. Enables magnification to be used even during recording. Enables the joystick on the camera’s grip unit to be set to operate the zoom. 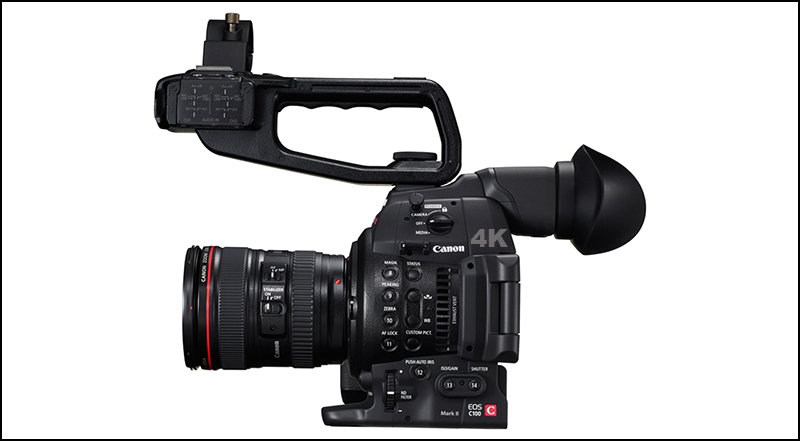 Enables control of iris to be set to manual operation, and control of focus, zoom and iris using the separately-sold Remote Controller RC-V100. 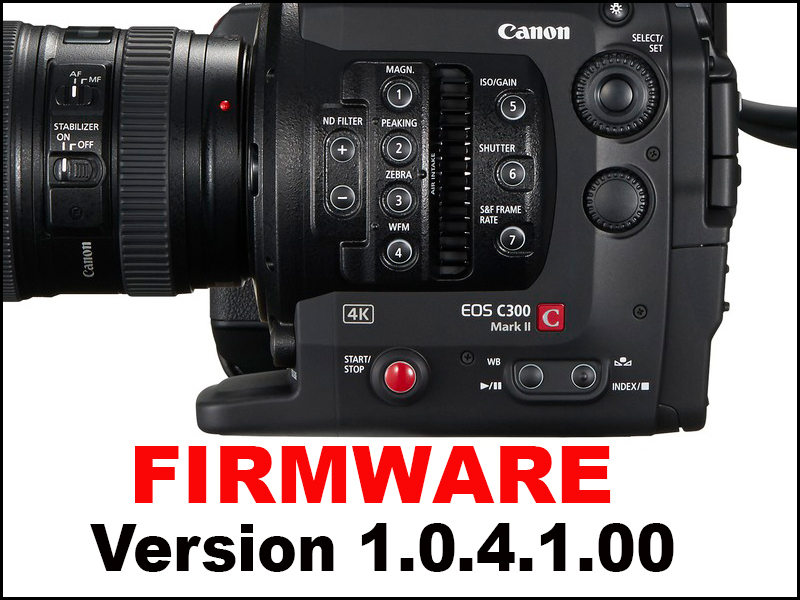 Enables automatic aperture and push auto iris functions. Enables retrieval of metadata, such as the model name and the focal distance of the lens attached, and display of metadata on the camera. 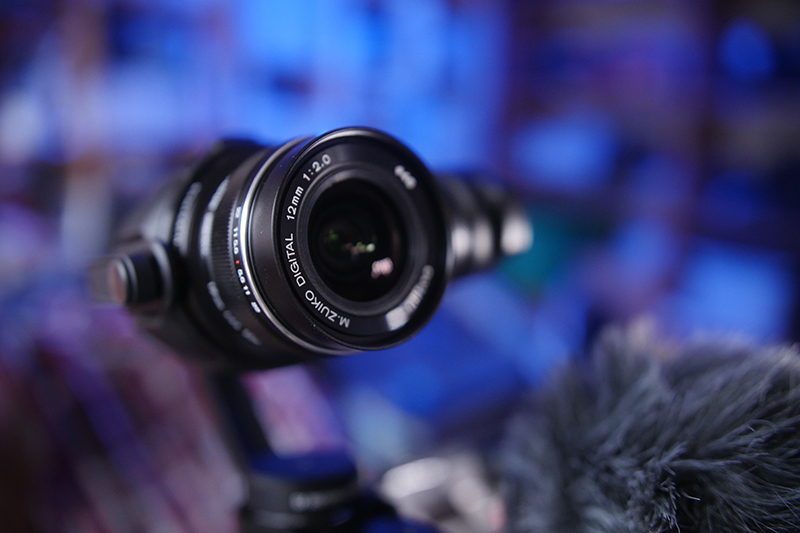 Enables Dual Pixel Function when these lenses are attached: CN7x17 KAS S/E1 lens, CN-E18-80mm T4.4 L IS KAS S lens or any of the EF cinema prime lenses. EF lenses: EF 35mm f/1.4L II USM, EF 50mm f/1.8 STM and EF-S 18-135mm f/3.5-5.6 IS USM. Enhances menu operations so that settings related to resolution/color sampling, etc. are retained to the extent possible when changing recording settings such as the frame rate. 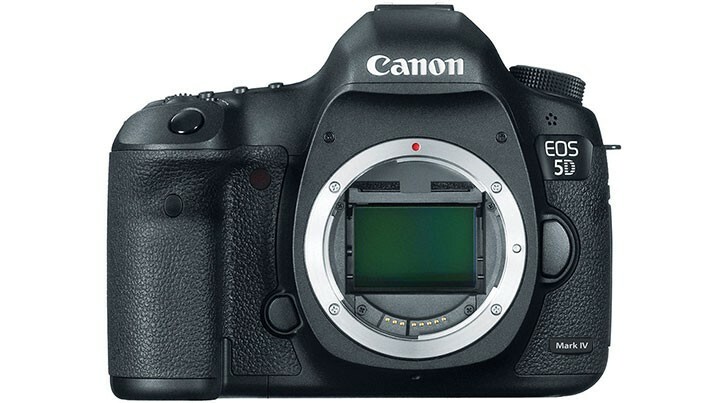 Canon Rumours are running a story about a 30MP Canon 5D Mk4 beyond this its anyones guess. 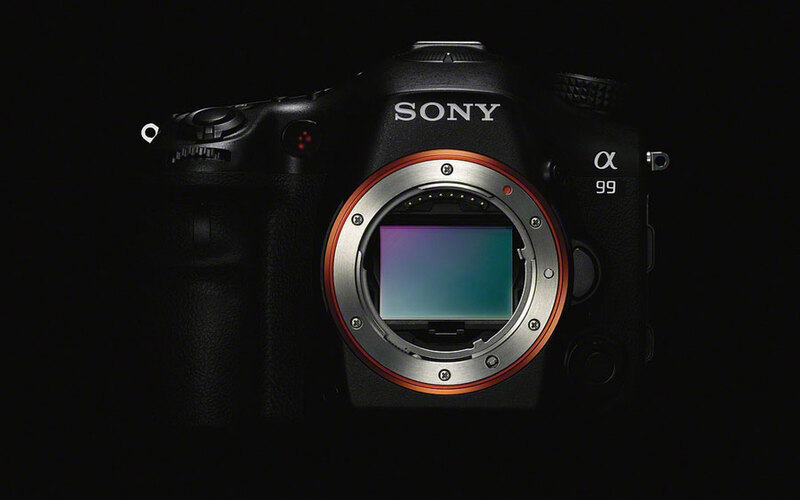 Sony Alpha Rumours are now betting on an Alpha 99 with the following specs..
Last but not least why has HDW sold his Sony FS7, is he giving up the ghost. Don’t be daft, I am slim lining my production, acquiring cash for a camera that has not been used for over 3 months since my mini stroke. I am starting a new venture that I can reveal very soon which still involves me writing the HDW blog. A stroke is very debilitating and makes you very tired by 3pm as your brain needs a cat nap to repair itself. Fortunately I have outstanding work that can be done in the mornings. I am realising a dream I have had kicking about my brain for over 5 years now and the stroke has focussed me into making it happen. 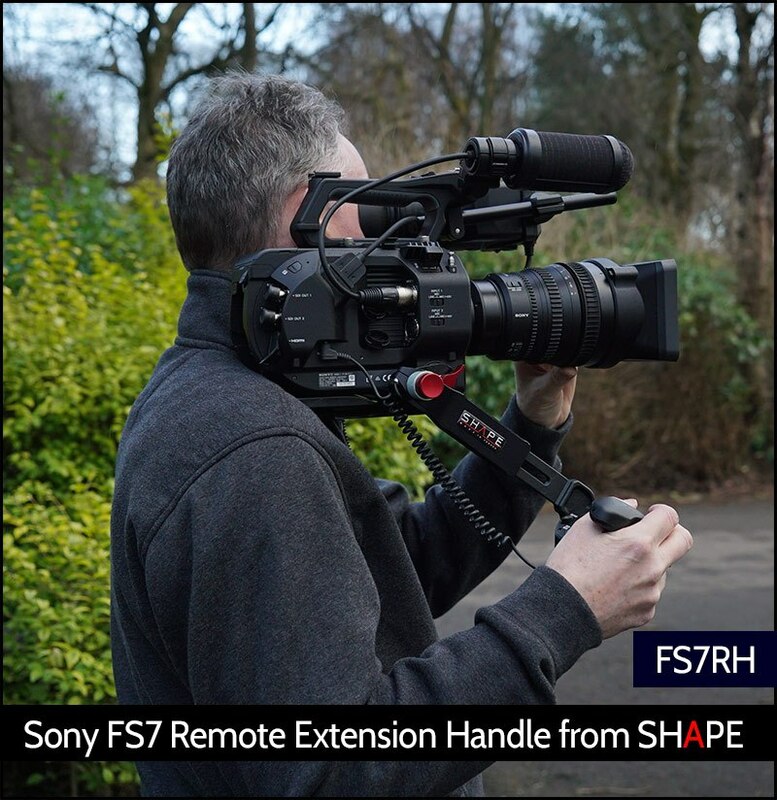 It needs the money I got from the FS7 sale to kickstart it but all will be revealed soon. 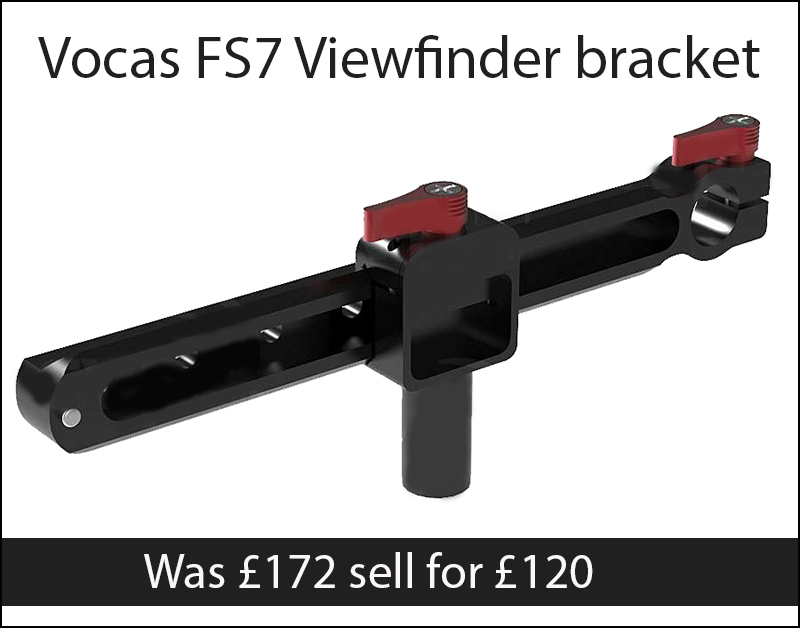 I have sold my Vocas FS7 VF bracket as seen above. 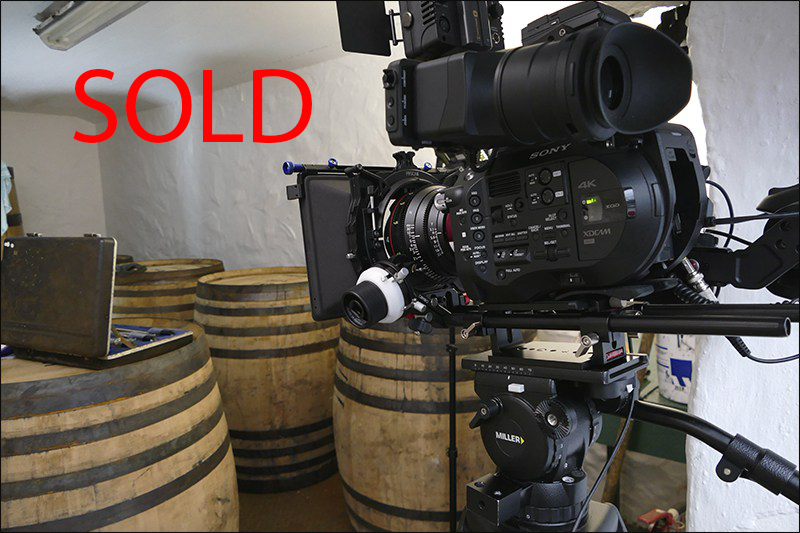 Finally I have to make a big decision to sell my trusty Sony FS7. 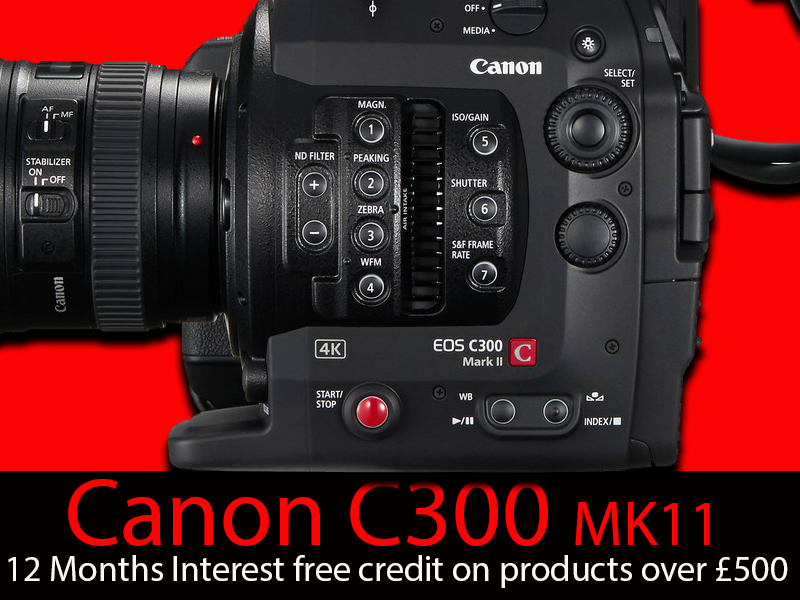 I am not using this camera and with a slight change in my career path the money would come in very handy. This is a UK only sale I am afraid. Will come in its original box and accessories. Note. 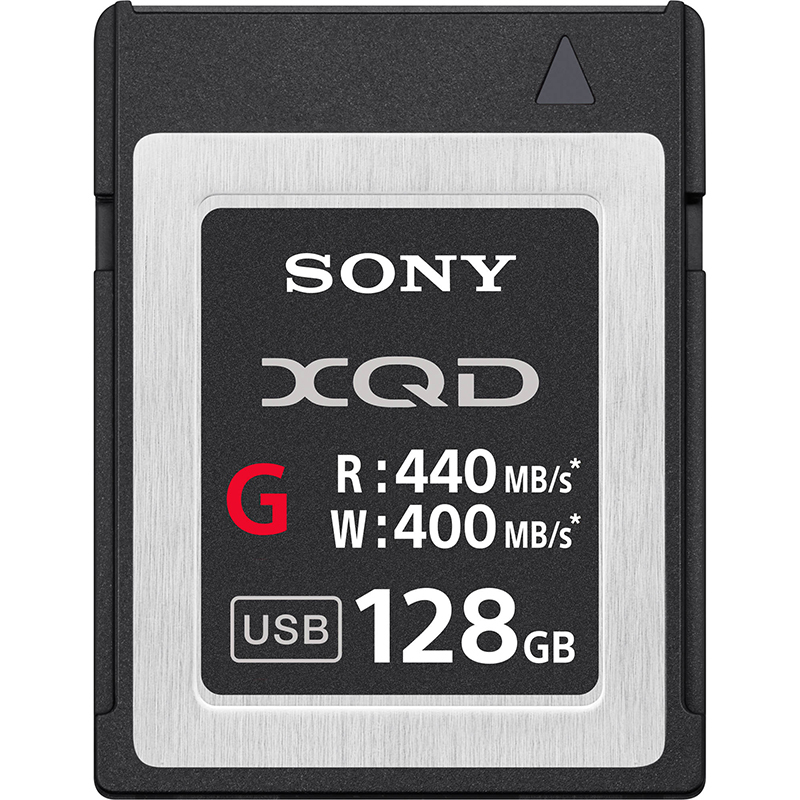 I will also be selling my XQD cards and spare camera battery, more about this later on today. As usual thanks for your interest the camera is now sold. 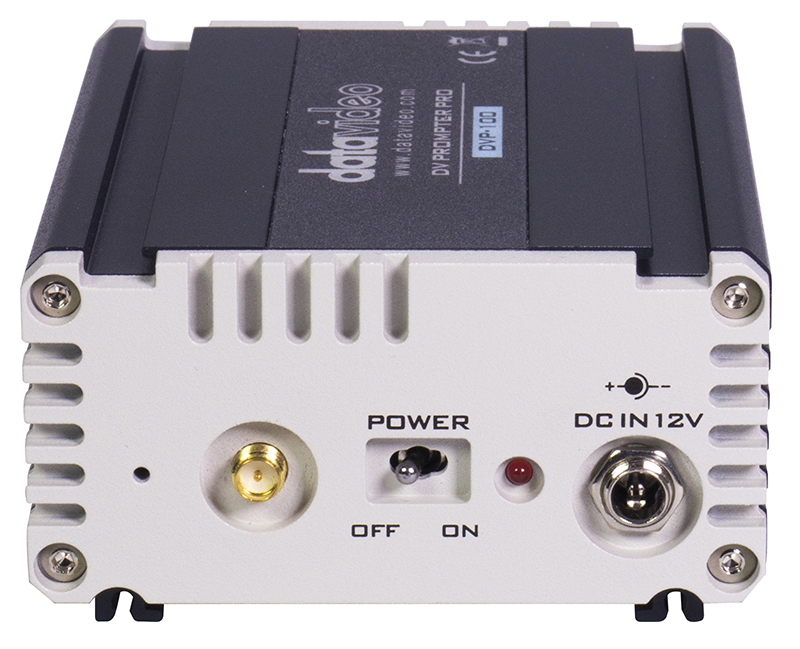 I don’t think there is any product on the market which looks less likely to impress than the DVP-100, yet within this wee box is a fully professional tele prompting system. It beats systems that are £1600 upwards and is very competitively priced at £360 plus vat. How do you keep multiple teleprompters synchonized? DVP-100 is the solution. It’s a wireless teleprompting system compatible with Mac, PC, Android and iOS devices. 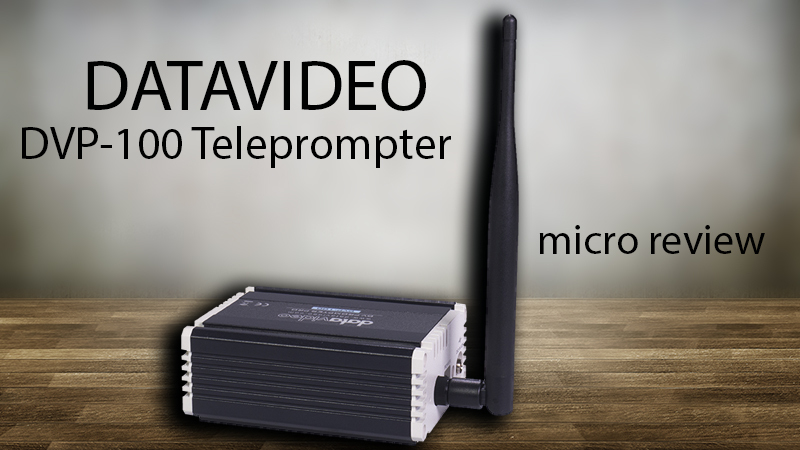 The dv Prompter Pro server creates its own WiFi hotspot ready for you to connect your devices and start prompting, once connected you can select if a device is to be a controller or a prompter screen and you can have an unlimited number of controllers or prompter screens. The controller can create and load new scripts, control the scrolling and perform live edits on all prompter screens in real time. If you want to mirror the iPad just touch the screen and job done…wee things like this make prompting a bit less tedious. All scripts are stored on the dvPrompter server not the devices themselves. 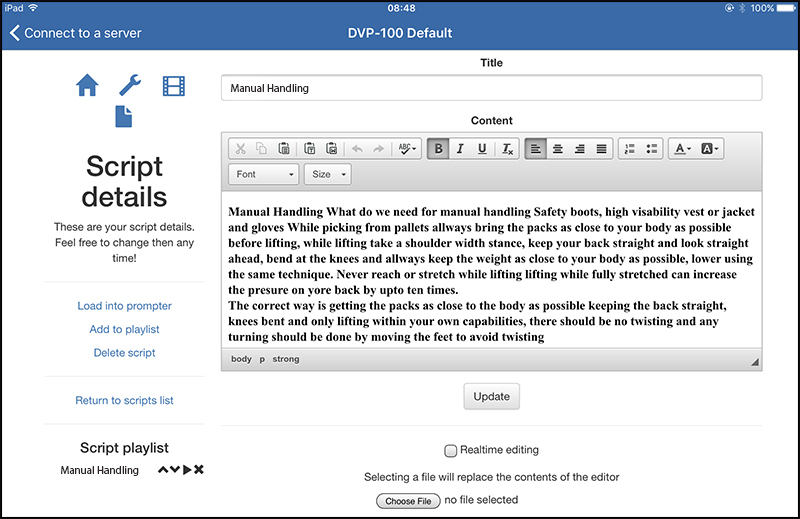 Value for money is beyond 5 stars, this is a fully functional professional prompter system which should wipe the competition in my opinion with a designer who knows his stuff. Remember you can have the script open on a laptop and LIVE EDIT into your script, this function alone is worth the £360 asking price ! Its LED video light with 2 light filters included allows reliable shooting even in night-time scenes and dark places as the color conversion filter adapts color temperature whereas the diffusion filter softens the light source. The outstanding low-light characteristics of the camcorder is a result of the built-in, newly-designed 1/3.1-type BSI sensor which achieves a high image quality of 6.03M effective pixels. This enables bright, beautiful shots even in dark places. 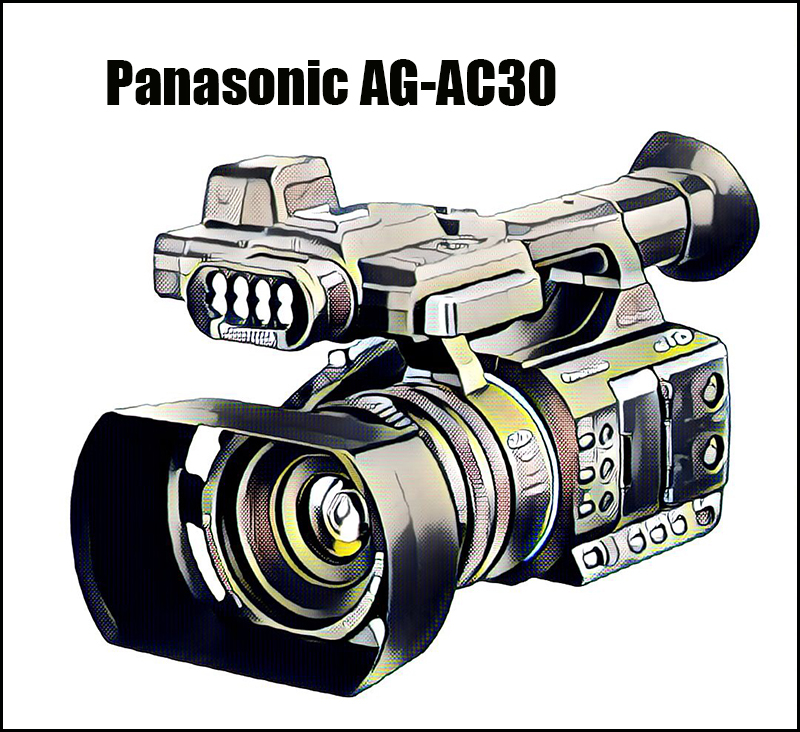 The AG-AC30 is a handheld camcorder with superb low-light characteristics and many professional features and tools, enabling the user to capture beautiful zoom shots and large groups thanks to its wide focal range (zoom 20x and 29.5 mm wide angle). 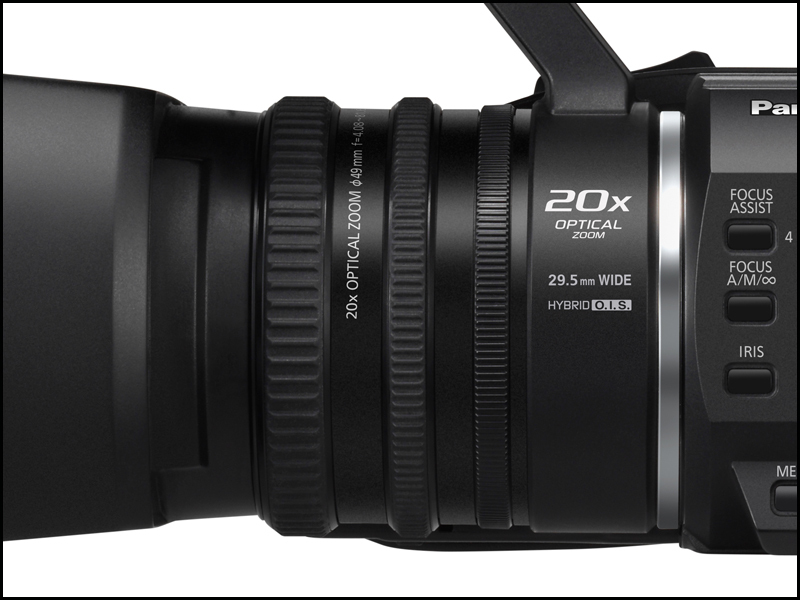 The powerful 20x super-high-resolution zoom can be utilized for shooting scenes that you cannot get close to. 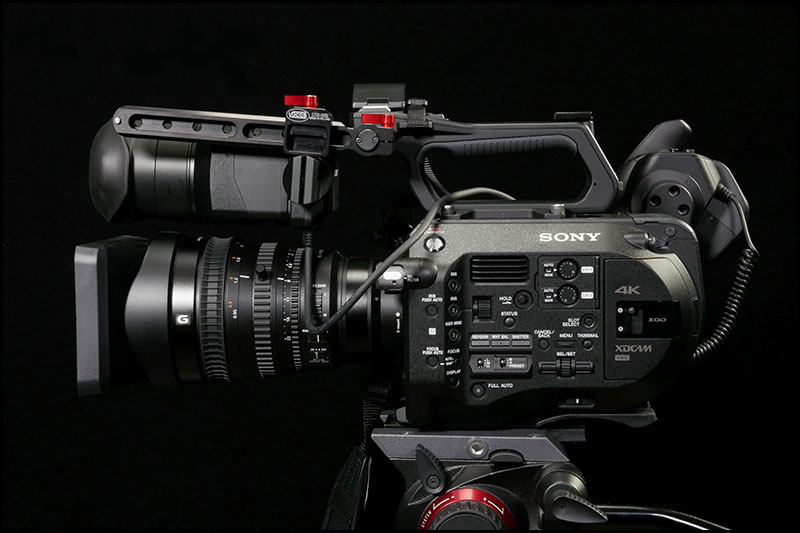 Intelligent Resolution technology allows for shooting at high zoom rates while preserving the image resolution. The 29.5mm wide-angle (35mm equivalent) fits more people and more of the background into the frame which is especially handy when wanting to take a group photo in a small room. To correct horizontal tilt and hand-shake blur the HYBRID O.I.S. 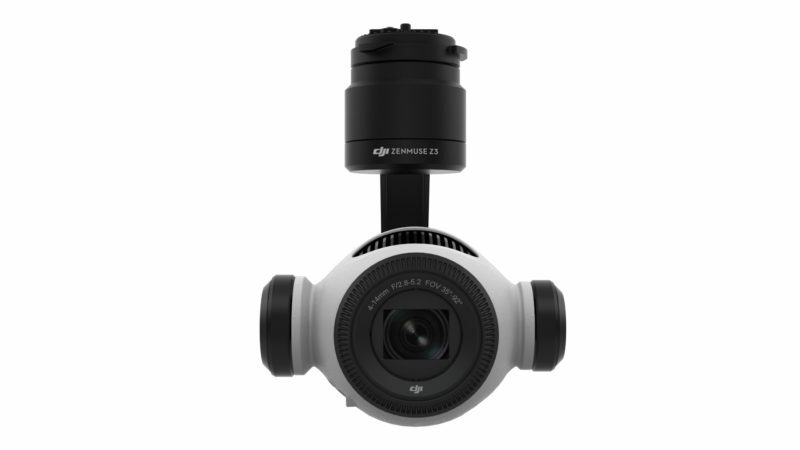 + uses five-axis correction to thoroughly suppress blurring all the way from wide-angle to powerful zoom shots. It also achieves great effects when shooting while walking or in other motion. The included Level Shot function automatically detects and corrects the tilting of captured images. The 3 manual rings of the camcorder (Focus, Zoom and Iris) add flexibility, provide control and adjust the light to get beautiful pictures regardless of the surrounding brightness. 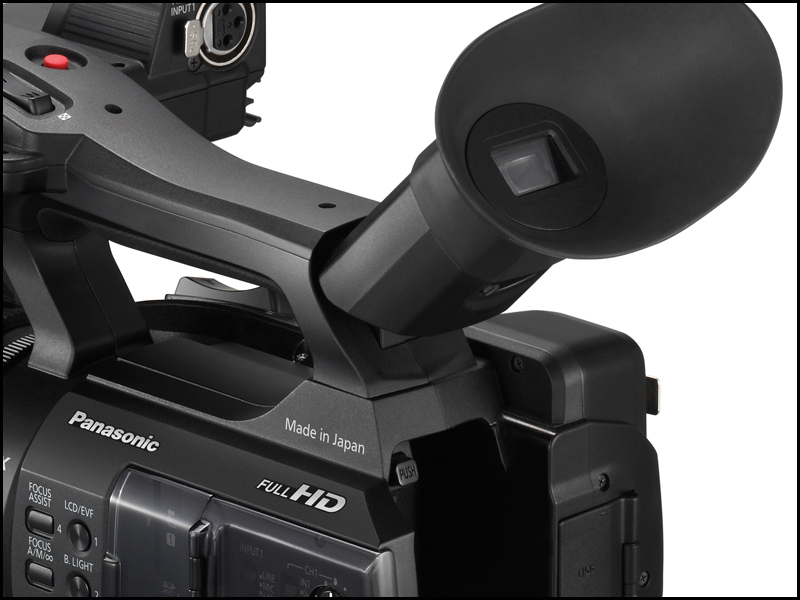 The 2-Channel XLR Audio Input Terminals of the camcorder enable the use of professional-spec, high-performance microphones for recording high-quality sound. 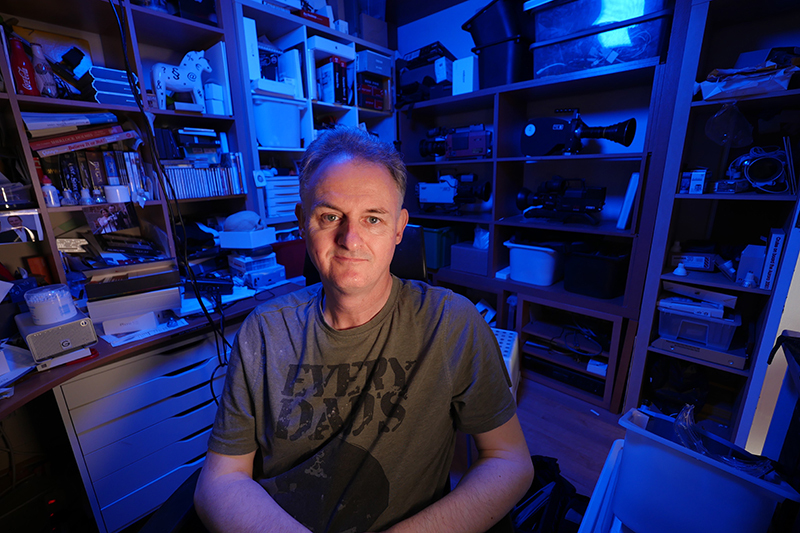 For more convenience, one input is positioned at the front of the camera and the other one at the back. 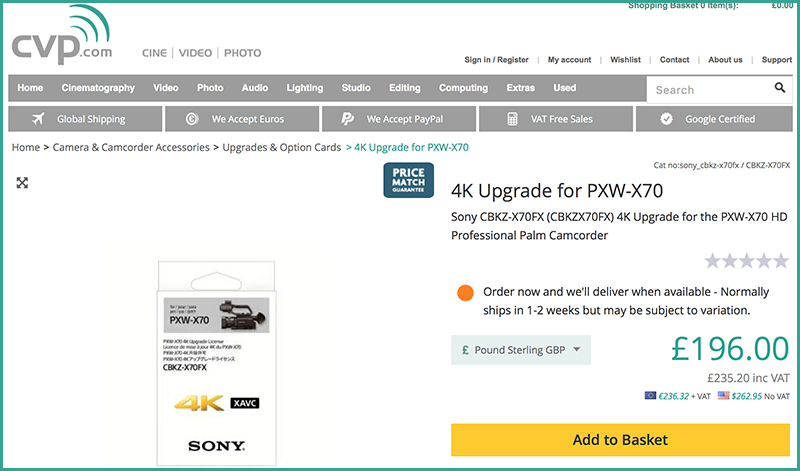 The 1,555K-dot-equivalent color viewfinder can be tilted for added convenience. 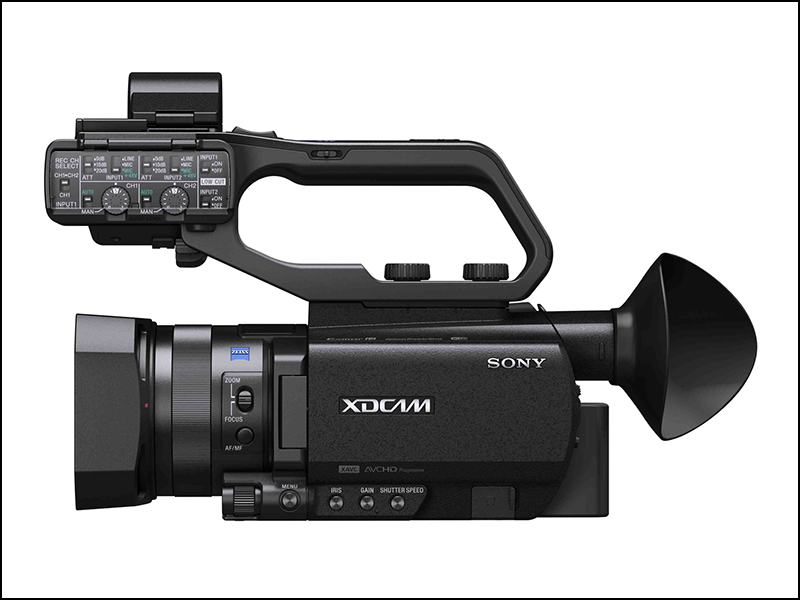 The versatile 3-type Slide-Retractable LCD of the camcorder has touch operation and serves as a high-definition, 460K-dot monitor and menu-setting touch panel. When not in use, it slides into the handle front for extra mobility and safety. 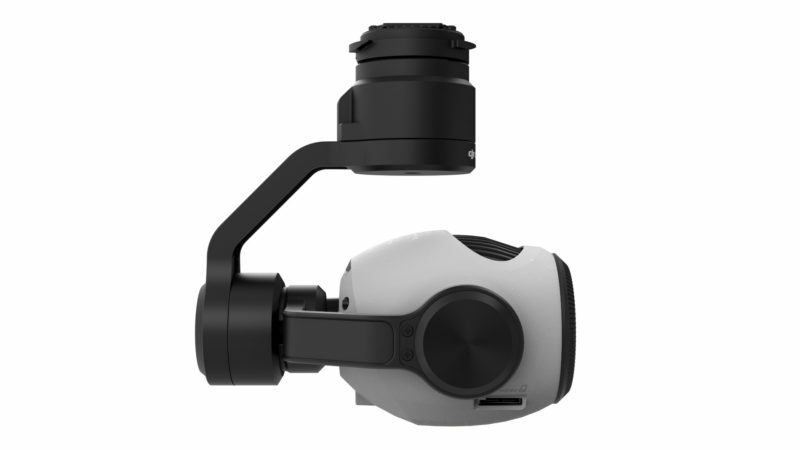 It also rotates 270 degrees vertically for easy high-angle, low-angle and self-interview shooting. 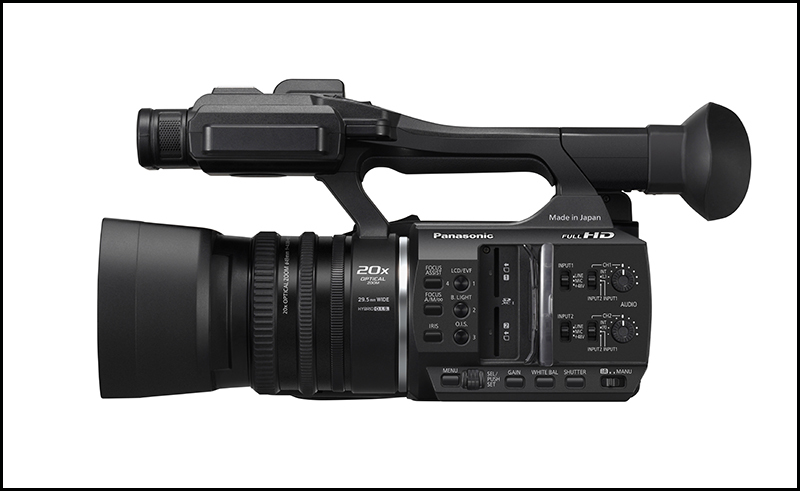 We have obtained the first footage shot from the Panasonic AG-AC30 produced by Richard Payne, Holden. 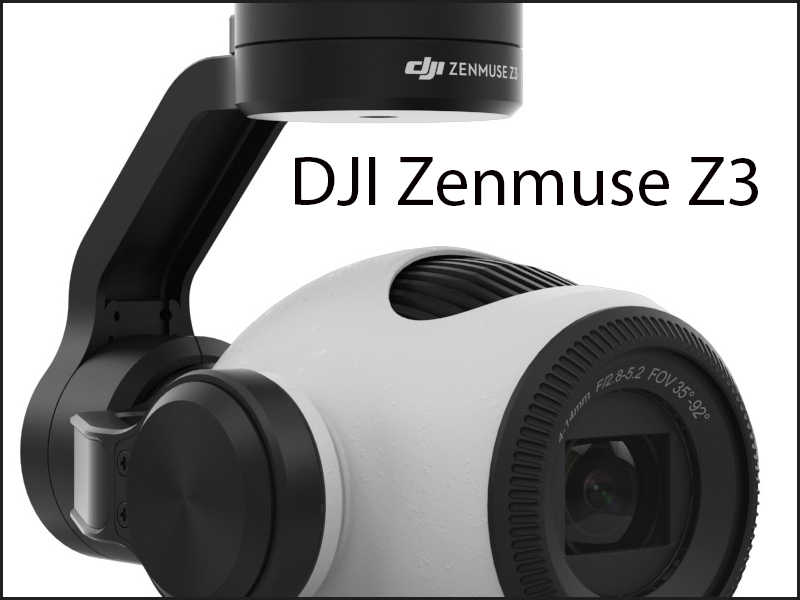 DJI, the world’s leading aerial-imaging company, on Thursday announced the Zenmuse Z3, DJI’s first integrated aerial zoom camera optimized for still photography.